Dickson Chumba crosses the line in first place at the 2014 Tokyo Marathon. 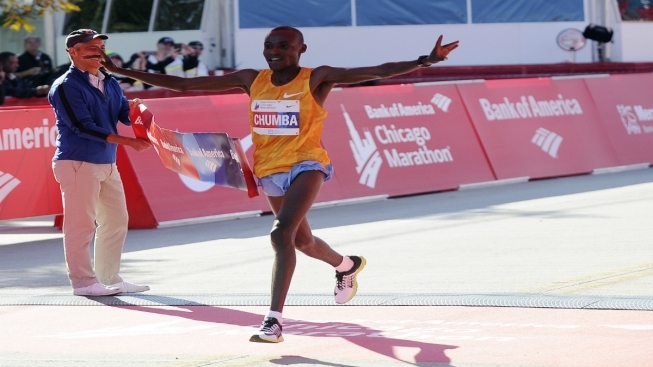 Dickson Chumba enters the 2014 Bank of America Chicago Marathon with the sixth-fastest personal best in the field (2:05:42). The Kenyan runner can already boast marathon wins in Rome, Eindhoven and Tokyo, and would love to add a North American first-place finish to his resume. Chumba is having a stellar 2014 so far. He smashed the course record at the Tokyo Marathon in February, knocking a full 4 seconds off of his previous best. Chumba has never competed in the Chicago Marathon before, which raises the question of whether he'll work with his fellow countrymen to push him for a faster time. "I think there are strategies, but the collective culture is competition," race director Carey Pinkowski says. "All of these athletes want to win, it's a major accomplishment that sets up their careers. Early on there's some strategy, and then you may see one of these individuals break out and run for home." Julian Gordon, a NIKE+ Pace team member, discusses the benefits of running the Bank of America Chicago Marathon with a pace team.